Can the Dow get past a huge psychological barrier at 18,000? Is now the time to pull the trigger on Amazon? Who’s going to buy Twitter? Hillary or Trump – who’s better for the markets? Will this scheme force the Brits out of the E.U.? Shah recently stopped by Making Money to discuss the upcoming “Brexit” vote. As a British citizen, Shah said that he’d be casting his vote for a Brexit on June 23 – and he predicted that a majority of his fellow countrymen would joint him, resulting in Great Britain’s exit from the European Union. But how will the markets take it? And what will become of Prime Minister David Cameron if Shah’s prediction comes true? This company is sitting on $178 billion in cash, and that number is growing every day. In Shah’s latest appearance on Fox Business, he tackles Apple Inc. (Nasdaq: AAPL), the cash-flow-generating machine. And he explains why you need to buy – now – while the price is still cheap. Shah talked about the market sell-off with Stuart Varney on Fox Business earlier this week. After discussing whether now is the time to be buying stocks, he took a look at several specific companies. Tesla Motors Inc. (Nasdaq: TSLA), Alibaba Group Holding Ltd. (NYSE: BABA) and Chipotle Mexican Grill Inc. (NYSE: CMG): Which are buys and which are scary? Shah lets us know. Click here. Are Stocks Ready to Pull Back? Have we come too far too fast? Could momentum carry stocks higher than they are now – or are we heading toward a dip? Shah appeared on Fox Business this week to discuss the possibility of a very volatile New Year. Oil, Gas, and Bank Stocks Are Tumbling Fast – What Now? How do you make money on this? That’s what Shah tackles during his latest appearance on Fox Business Wednesday. Why are oil, gas and big bank stocks tumbling? Who should you be wary of? Where is the safest place to invest your money right now? Shah has the answers. Could the Dow Hit 18K by Thanksgiving? There is nothing in the market’s way right now. While stocks travel the path of least resistance, how soon will the Dow Jones Industrial Average hit 18,000 and beyond? Shah talked with Stuart Varney on Fox Business on Monday about a year-end rally – and the one stock that will profit the most from these peak prices. The Contagion Worse than Ebola? Global growth is going the wrong way. The lynchpin? Europe. “The U.S. is the cleanest dirty shirt in the laundry once again,” says Shah. In fact, he joined Varney & Co. to report the issues facing Europe will cause contagion in the U.S. In fact, Shah believes the markets are headed for a major swoon and pinpoints where most of the selling will inevitably occur. The Dow Jones Industrial Average has already fallen more than 200 points today. And some are describing the plummet as a “black swan” event. But is this a “black swan”? 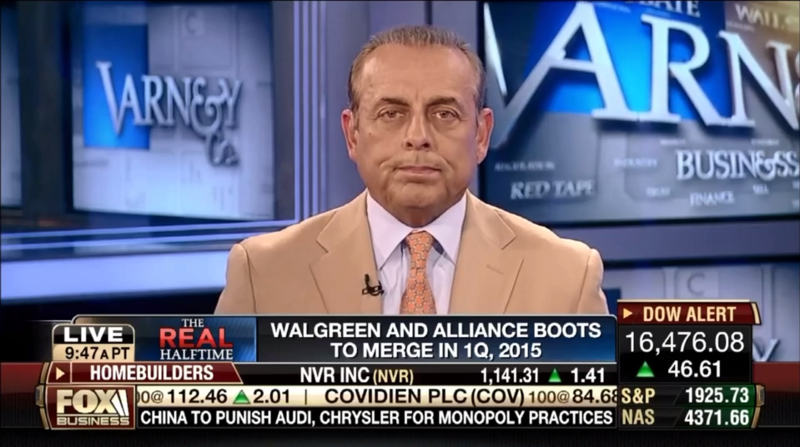 Shah appeared on Fox Business’ Varney & Co. to let us know what he thinks is moving the market. Despite wide expectations that it would, the Walgreen Co. (NYSE: WAG) said Wednesday that it is not moving its headquarters overseas as part of a “tax inversion” deal designed to avoid high U.S. corporate taxes. Wall Street was not amused, lopping 14.5% off Wallgreens’ share price. While a tax inversion would have saved it millions in lower taxes, Walgreens made the right decision.